When I first arrived at Rock Pointe and entered the building it must have been the lull period between services or something. No greeters or anyone to tell me where to go, so I found my typical back row pew and just, well sat. Yes, you read that correctly – a pew. Haven’t sat in one of those in quite a long time! Ha! I noticed hymn books had been replaced with Bibles in the back of the pews for those who had forgotten to bring theirs. Several people just kind of looked at me and about 3 or 4 minutes later a whole stream of people entered. Then I was greeted by the pastor and another gentleman. Music started with the praise band facing the screen rather than us with music and clapping. 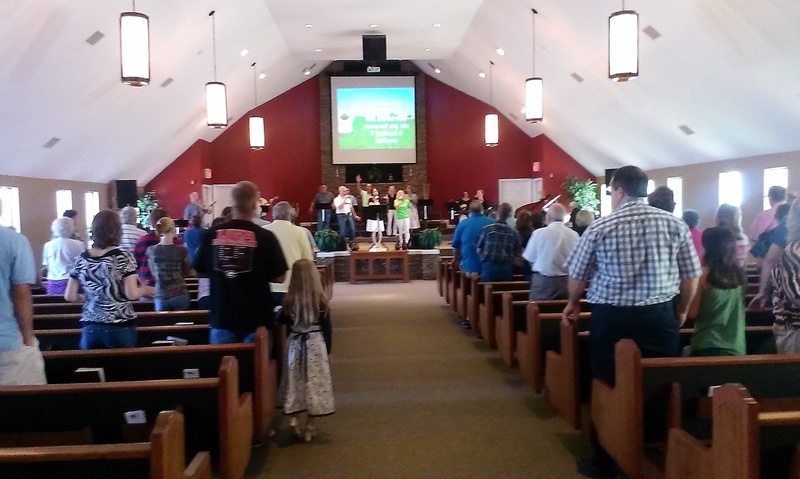 After a few moments, the praise team turned around, prayed, and led us into the music part of the service. Talk about a trip down memory lane – I sort of felt like I was at a Gaither concert! The songs reminded me of that good ‘ol gospel music with a contemporary twist. It was refreshing. I didn’t feel like I was in a rock concert or anything. Just praise, love, adoration, hand-clapping, smiles and blended harmonies raised up to the King of Kings. The first song was a lively, joyous hand-clapping version of “My Redeemer Lives” followed by the pastor welcoming a new member to the church. He read a “membership covenant” which reminded me of a marriage ceremony. If Christians took their vows to each other seriously to actually serve and love one another, I wonder where our world might be? I really liked their approach. I can tell this church takes its family seriously. I found out the “lull” I had experienced in the beginning was actually people attending an advanced membership class. Next was a time of fellowship and shaking hands. Folks, you know me – I grinned and beared it – ha! But I will admit, George and Sherry were authentically friendly. I loved the fact that all ages were represented. Just down-home country folks who obviously loved being there. It was a very casual and warm family-like environment. The next hymn was one of my favorites, “Here In the Power of Christ I’ll Stand,” and they didn’t change the words of “the wrath of God was satisfied!” I’m sure you’ve heard all that brew ha ha. Personally, I’m glad they didn’t change the words. It’s Biblical and the song should remain as it. Praise God! As we moved into the next song about God’s faithfulness, there was a reverential silence that fell over the group as we were asked to reflect on the day we were saved. Next the Pastor called all the school age children up to the front and prayed a blessing over them and the children’s church workers as the new school year began. The pastor encouraged these children that Jesus was with them during a test, in the classroom, when they feel scared…He is always looking over his children. “Jesus, I need your help…I don’t understand this math. Jesus, I need your help…there’s a bully here.” The pastor prayed the children would gain an understanding of the importance of their education and for them to grasp and understand the classes they needed to take. He then moved into announcements, one of which was a charge to ask men to step up to help in the children’s ministry. He said there was a need in this generation for godly men to be present and accounted for in children’s settings. Amen to that! He also updated us on their latest ministry outreach to Walker State Prison. The church cooked 1,000 hamburgers, and served popcorn, sodas, nachos, and cakes. Walker State prisoners painted a picture of Jesus praying in the garden of Gethsemane which the church plans to hang in their building. Wow! The painting was just beautiful. I was reminded that most of these prisoners are gifted way beyond what we tend to recognize. They have great potential and God wants to use them and He loves them so much. I was moved to tears as I know people who are caught in addictions that have led to jail and prison sentences. And I was overwhelmed at this church’s heart to reach out to those who are in bonds. Thank you God for a church that still cares to do things like this. The offering plate was passed and then George did some special music entitled “To the King.” I must admit I almost felt like I was back in my home church when I was a kid. The music had changed some, but it was that same feeling of corporate worship, offering time, special music, prayer…it was a bit nostalgic for me. When a person is transformed because of salvation, good works are a result of that salvation. Our job is to be light in a dark world. We are to be like a sprinkling of salt which changes the whole flavor. A transformed life will begin to produce good deeds and God will bless us. A blessed life will reflect good deeds (e.g. I am no longer selfish, I now want to share). Our salvation is a free gift from God apart from works, however an authentic transformation of the heart will result in good deeds. A life that God blesses has four components: heart transformed (which he talked about the week before), good deeds (this week’s topic), obedience and incredible faith (which he plans to cover in future weeks). Where are we investing our time, talent, and resources? “Well that’s not my cup of tea?” Since when did God give us cups of tea to choose from? Service is something we do even when we don’t want to do it (boy, I need to learn that lesson!). God is not going to bless your mess just because you enjoy it. God gets in the middle of what He wants to do through us. [Ok preacher, I’m listening]. God already knows what He has called us to do. But he may be testing us to see what our response will be (verses 6-9). Are we willing to give our sack lunch to Jesus? Believe that God’s blessing pronounced over our sack lunch will be used in an incredible way to feed hungry people all around us. Pray over our money before we go to the store. Ask Him to stretch the money. Ask God to bless what we’ve bought. Thank Him. God will not bless us if we are robbing from Him. If we have not been able to conquer tithing, we will always struggle to be blessed by God. When God blesses the 90%, it goes further than the 100% of our own efforts. We don’t do this to be blessed – we do it out of obedience. It is what God teaches us about our finances. And it’s not just the tithe. It’s talents and resources too. For some of us, writing the check is the easy part. What about the hard part? What about serving and teaching or whatever it is that is hard? Sink our whole life into what God is doing. Stop tip toeing around God and get involved. Give it all. Not just the excess. Not just a little bit. God wants to work in our lives in ways we can’t explain. Our good deeds pave the way for a godly life. Our good deeds are the one and only way we connect the love of Jesus to a lost, dying world. It’s how the world sees Jesus. Pastor Keith just shoots is straight. Tells it like it is. Love that about him. No condemnation, just keeping it real. Get serious with God and quit playing games. Understand that before you were born, God had a plan to use you to connect others to Him. You have to choose to surrender to His will. Sometimes the road is rocky. Sometimes you will suffer. The blessing is about an entire lifetime – love, joy, peace, tangible, intangible. He provided an altar call for Christians to give their selves 100%, and as they gathered round he made an audible covenant with them and sealed it with a prayer. I can tell this church is about accountability. Not just lip service but real life service looking for opportunities to bless someone. Rock Pointe Church is located at 1278 Cross Street in Fort Oglethorpe, GA. Their phone number is 706-820-6523. Their website is http://heismyrock.com and you can find them on Facebook at www.facebook.com/rockpointewc. They meet Sundays at 10:00am and 6:00pm and Wednesdays at 7:00pm.